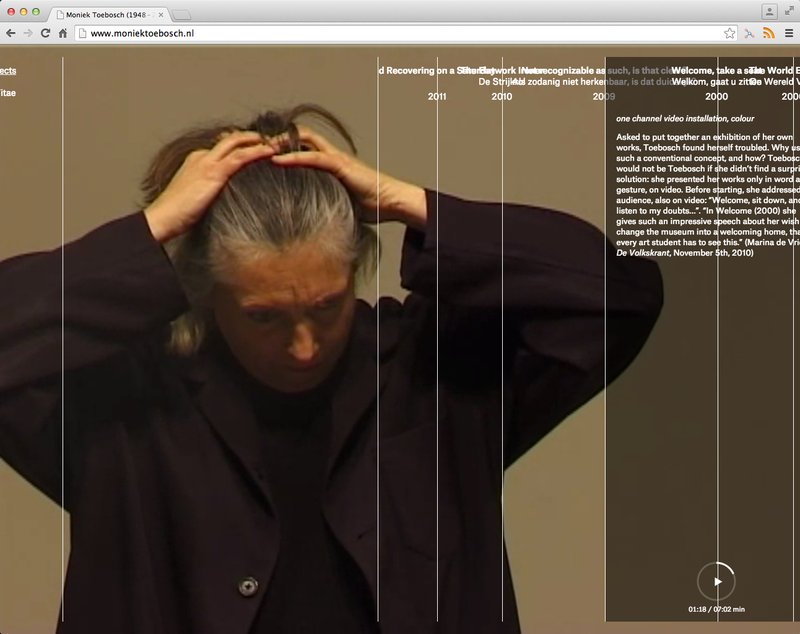 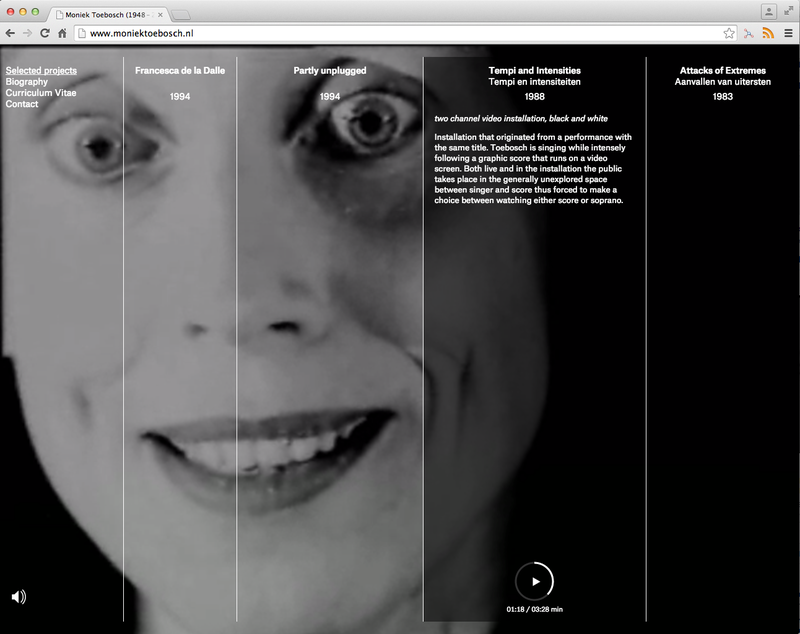 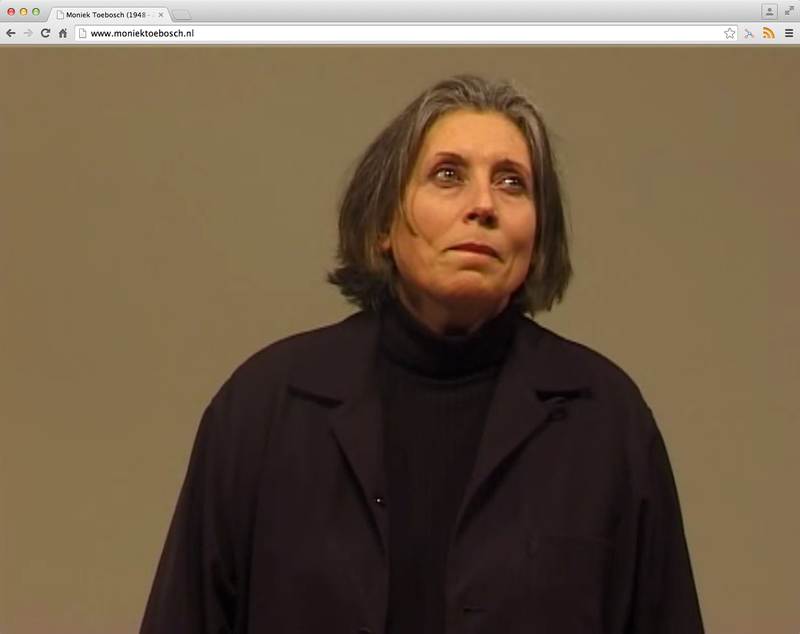 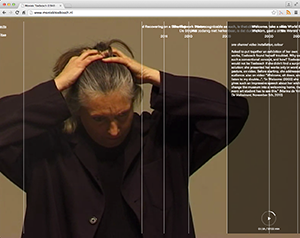 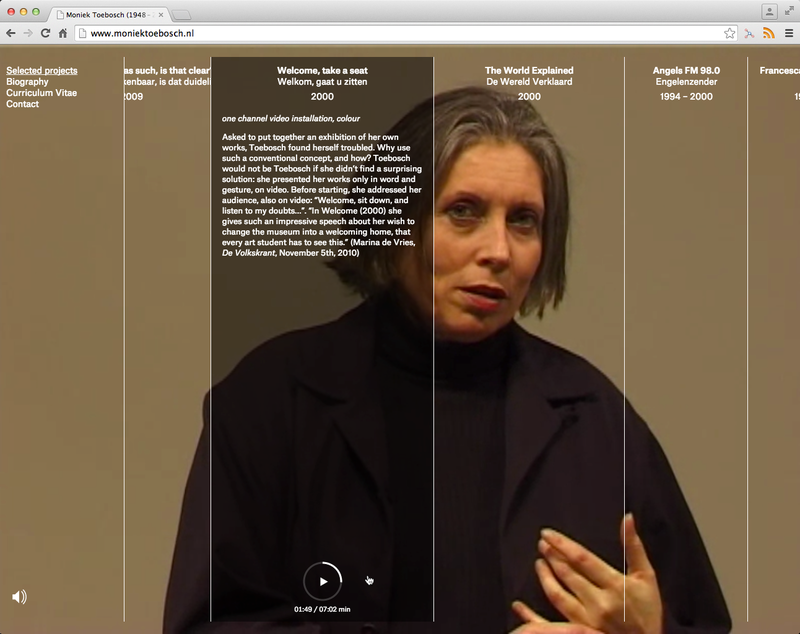 The updated version of www.moniektoebosch.nl puts relevant highlights of Moniek Toebosch’s audio-visual work on a timeline and makes a few formerly unavailable pieces publicly accessible. 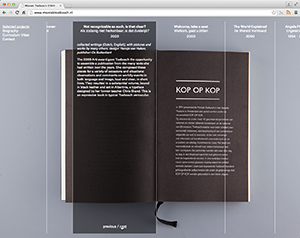 As a mentor and educator, Moniek stated in her last wish for her work to remain available to the public. This new release includes unused documentation material of projects like Angels FM 98.0 (Engelenzender), Tempi and Intensities and The Flatwork Ironer and rather unknown film footage by Dutch experimental film-maker Frans Zwartjes. 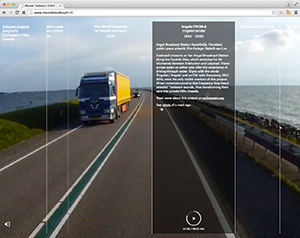 The website provides a dynamic interface that hides and reappears according to the activity of the user, and creates an immersive viewing experience by edging out the web browser. 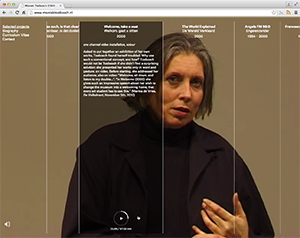 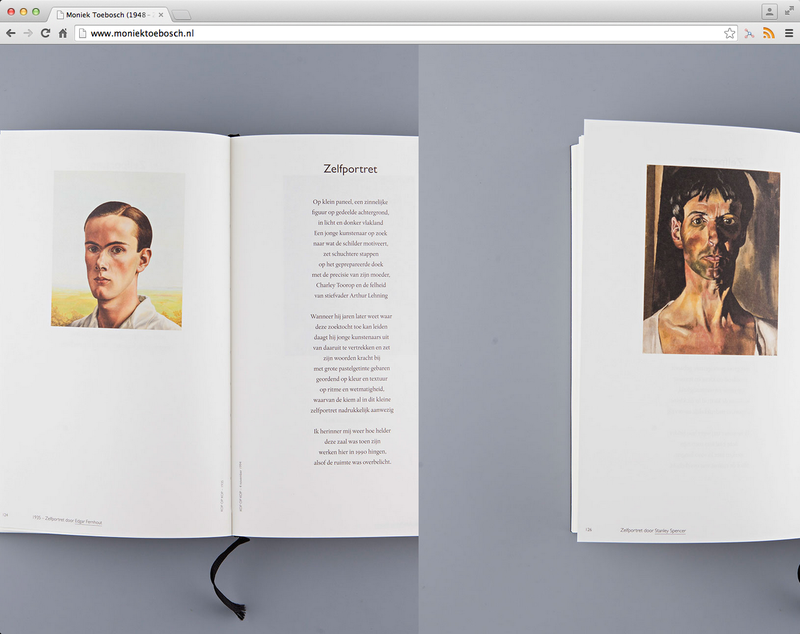 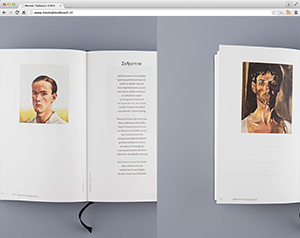 Moving the mouse horizontally across the screen allows to browse the project archive. 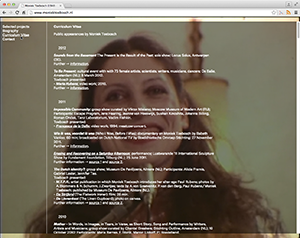 The video controls are located at the bottom of each project column. When idle, the interface elements hide in favor of a fullscreen movie experience. Where available, the user can switch between video and photo material. 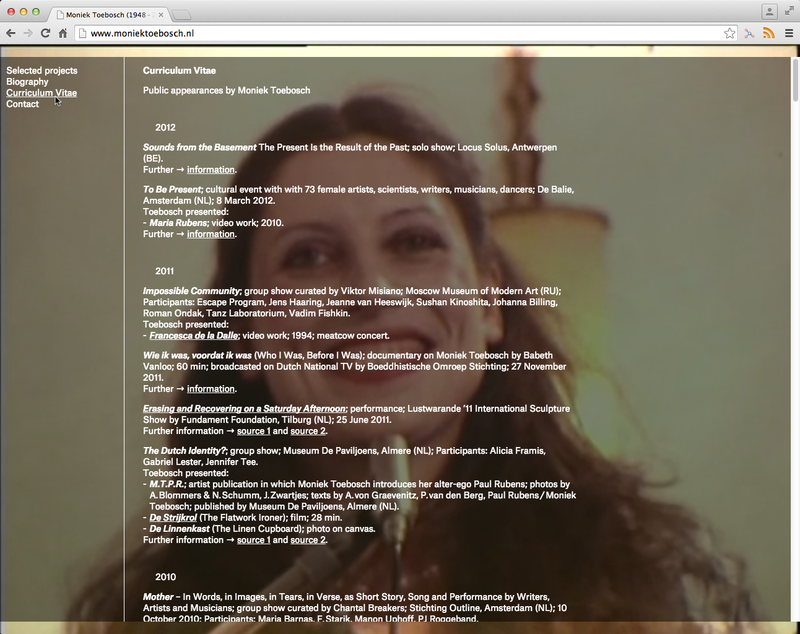 Some projects are documented in form of a slide show. 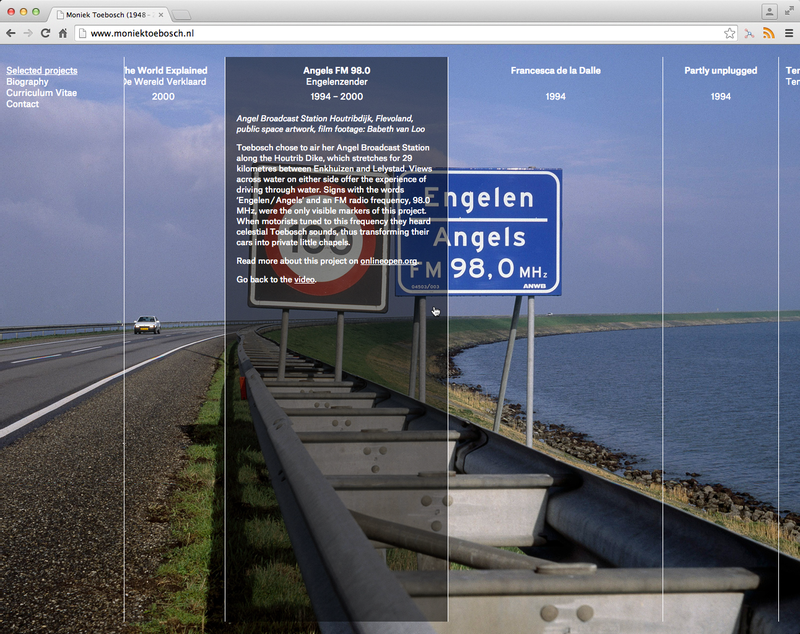 Left and right arrow keys enable controlling the slides in the fullscreen mode. 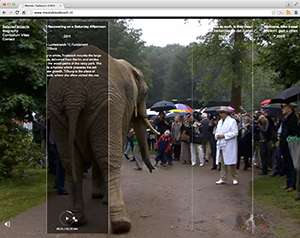 Clicking on the project column in focus pauses or plays the related video. 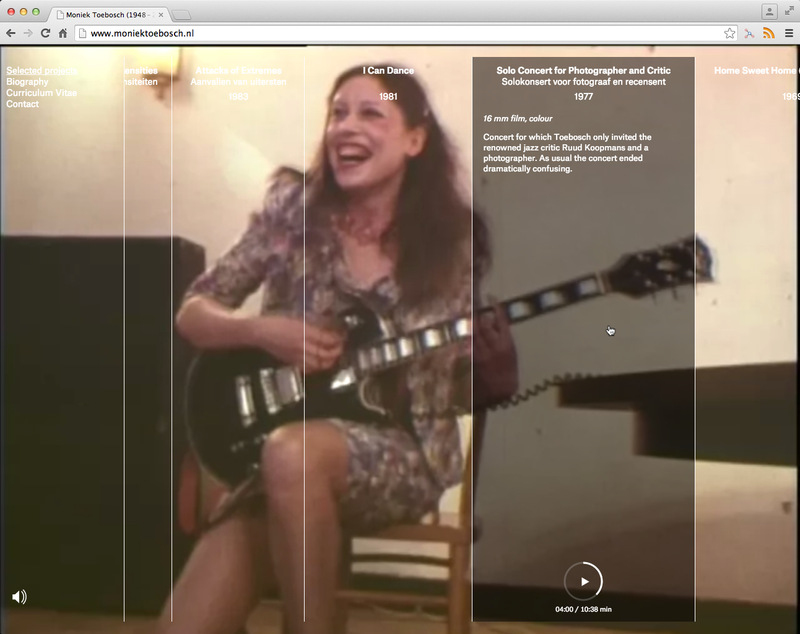 Additional controls allow to jump to the desired moment in the video. 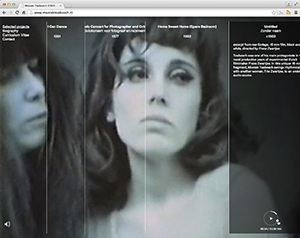 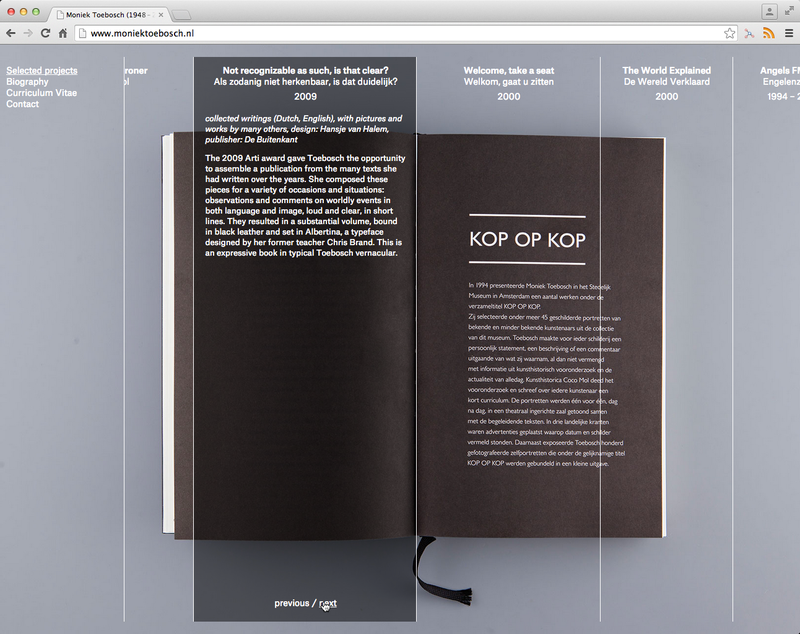 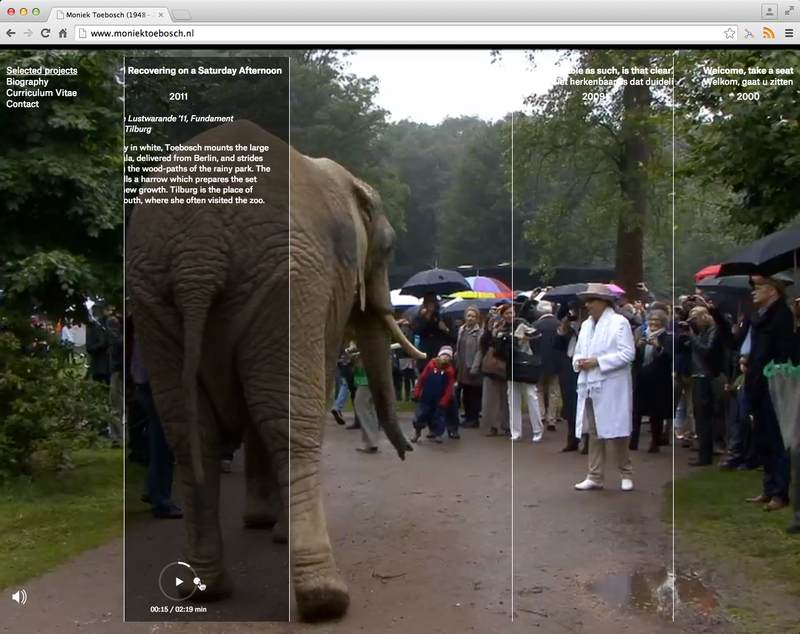 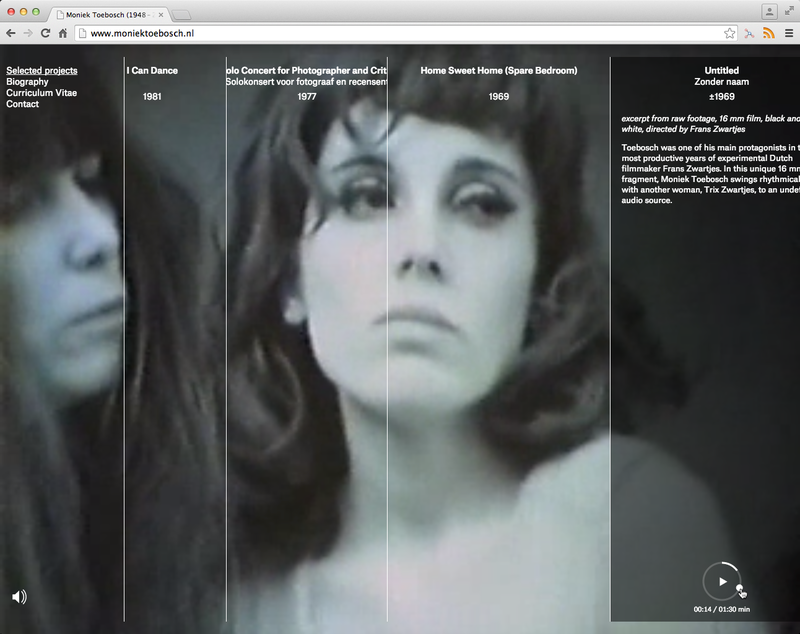 Other sections of the website are presented over stills of project videos.